HOUSTON – The Bureau of Alcohol, Tobacco, Firearms and Explosives (ATF); and the National Shooting Sports Foundation (NSSF), the trade association for the firearms industry have announced a combined reward of up to $15,000, along with Crime Stoppers of Houston, who has offered an additional reward of up to $5,000, for information leading to the identification and/or arrest(s) of suspects responsible for committing an Armed Robbery of Cash America Pawn, located at 13718 State Highway 249, Houston, Texas. 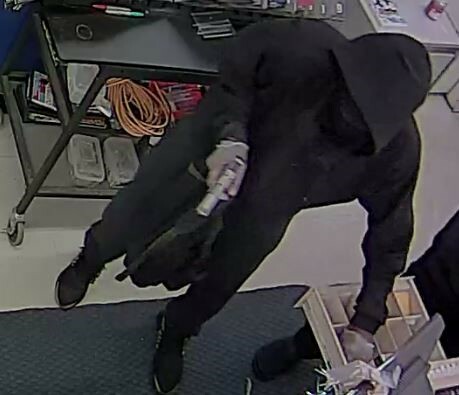 On March 31, 2018, at approximately 9:04 am, two male suspects, armed with pistols, entered the store while it was open. The suspects stole eight (8) firearms, cash, and jewelry from both the store as well as its customers. Suspect #1 is described as Hispanic or black, 18-22 years of age, 180 pounds, wearing a black hoodie, gray sweatpants, gray tennis shoes, a black ski mask, rubber gloves, and a gray and teal backpack. Suspect #2 is described as a black male, 18-22 years of age, 150 pounds, black hoodie and sweatpants, a black rag over his face, rubber gloves, and black and gold Nike Presto shoes. “We find it reprehensible that anyone would take advantage of a business, placing fear in the lives of both store employees and customers. ATF is working tirelessly to find and hold the persons responsible for this crime accountable,” said ATF Houston Field Division Special Agent in Charge Fred Milanowski. Anyone with any information about this crime should contact CrimeStoppers of Houston at 713-222-TIPS (8477). Individuals can also submit information through the mobile reportit® app, available both on Google Play and the Apple App Store.